This is one of the first lamps I made for a friend, hence the name. I've discontinued making them and have moved onto new things. Kath is a contemporary design with an Asian influence and strong architectural features. 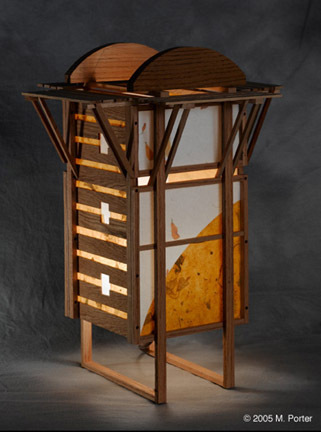 Each lamp is made to order using cherry, oak, and hand-cut textured papers. The lamp uses one 25-watt incandescent bulb (included), 40-watt max. Signed on shade, Kath will be a limited edition of no more than 5 pieces.